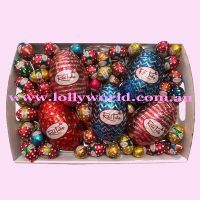 Red Tulip Easter Box contains 5 x 50g Red Tulip milk chocolate hollow eggs and 400g mix of Red Tulip solid mini eggs and caramel filled mini eggs. This basket will come wrapped in cellophane and ribbons. Perfect for an Easter gift. Cellophane and ribbons removed for photo illustration only.